INDUSTRY.co.id - Jakarta- President Joko Widodo used the long weekend holiday to gather with his family in his hometown of Solo, Central Java. Deputy for Protocol, Press and Media Secretariat of President Bey Machmudin in a statement received in Jakarta, Friday (30/3/2018) said the President took time with his family to eat soup in the city. Kedung Soto Gading store located at Jalan Brigjen Sudiarto Number 75, Joyosuran, Pasar Kliwon, Solo, became the choice of Head of State and family. Soto house that has become a subscription Joko Widodo since still be the mayor of Solo. The President came with First Lady Iriana Joko Widodo. Also present his first son Gibran Rakabuming and his wife Selvi Ananda. Not to forget their son who is also the first grandson of the President, Jan Ethes. Kahiyang Ayu participated with her husband, Bobby Nasution. President Jokowi wore a white shirt. Likewise, Gibran and Selvi are compact wearing a matching colored boss with the President. While Mother Iriana and Kahiyang wear batik tops. 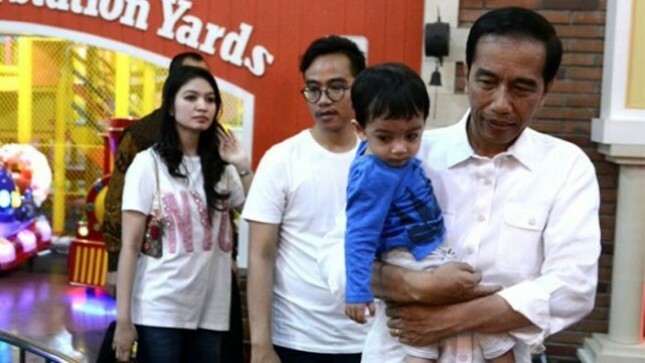 The President and his family arrived at the shop that Siswo Martono operated since 1974 at 08.23 WIB. According to Bey, warm atmosphere looks when the President of the family sat a table enjoying the soup served. Presence of the President makes the store more crowded. Not a few people who want to Selfie and shake hands with the President. While carrying Jan Ethes, the President is happy to take pictures with the community.